Tonight we were sitting around trying to figure out what to have for dinner. We had a late (and big) lunch – perfect for afternoon football. That led to the “ugh, what are we going to eat” around 6:50pm. Since my fantasy football team was epically failing (coupled with the fact that my opponent had Arian Foster and Matt Forte that decided to score a combined 71 points), I decided to try to figure out something to make. Based on the ingredients we had in-house I came up with the following. 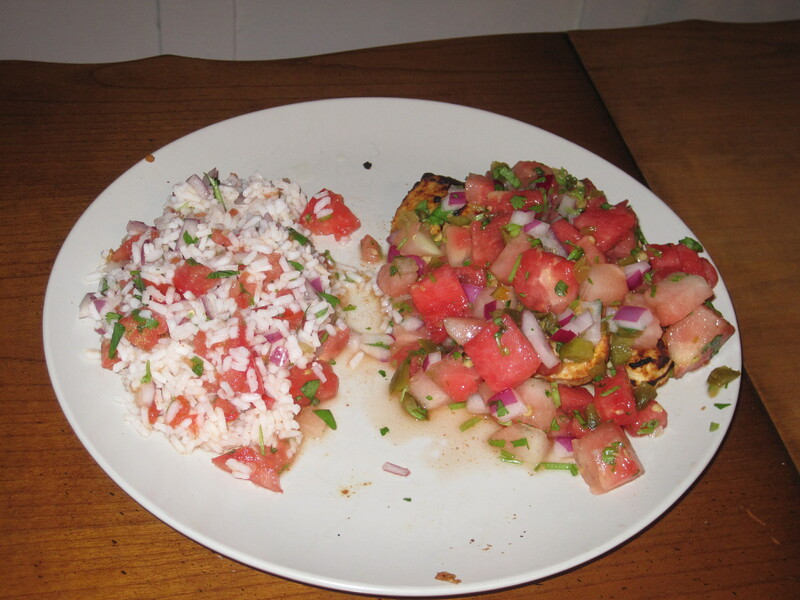 The watermelon salsa and spice for the chicken were higher based on taste preferences. If you don’t like spicy foods I would recommend decreasing the amount of jalapenos in the salsa and the cayenne for the chicken. This recipe was made half with real chicken and half with Quorn chik’n so it can be made for the meat-eater and the vegetarian/pescaterian. Cook time: Approximately 10-15 minutes. 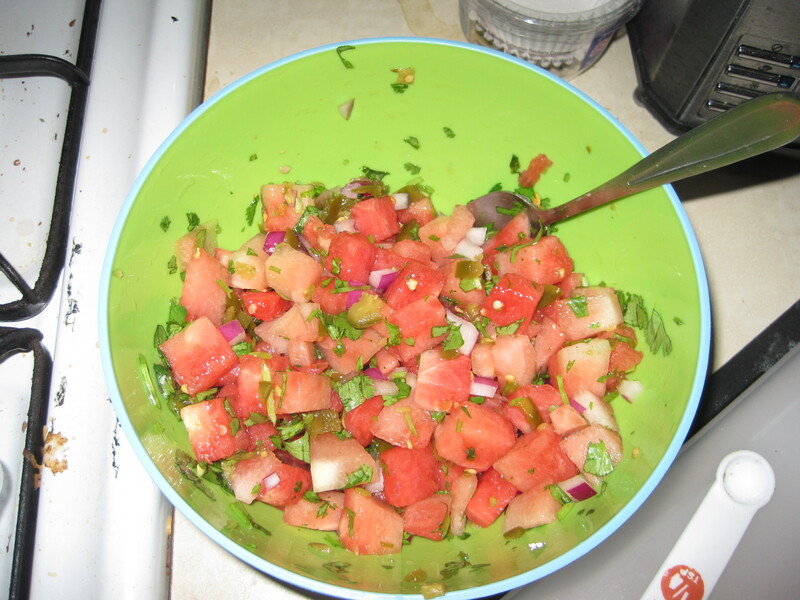 Chop watermelon, jalapenos, red onion and cilantro. Combine. I used jalapenos from a jar but fresh jalapenos can be substituted if seeded prior to including in salsa. Add lime juice, sugar, salt and cumin. Mix well. Preheat grill on high. Combine ingredients and mix well. Rub marinade unto chicken. Place chicken on grill. Cook on each side for 6 minutes. Then cook on each side for an additional 2 minutes. I used instant rice for this recipe because I was looking to make a quick meal. Bring 1 cup of water to a boil. When water is boiling, remove from heat add instant rice. Stir in instant rice and cover. Let stand for approximately 5 minutes. Once rice is ready add chopped red onion, cilantro, tomato, and salsa. Mix together to make sure spices are well-distributed. Add lime juice, cumin, salt, and ground red pepper. Mix well. 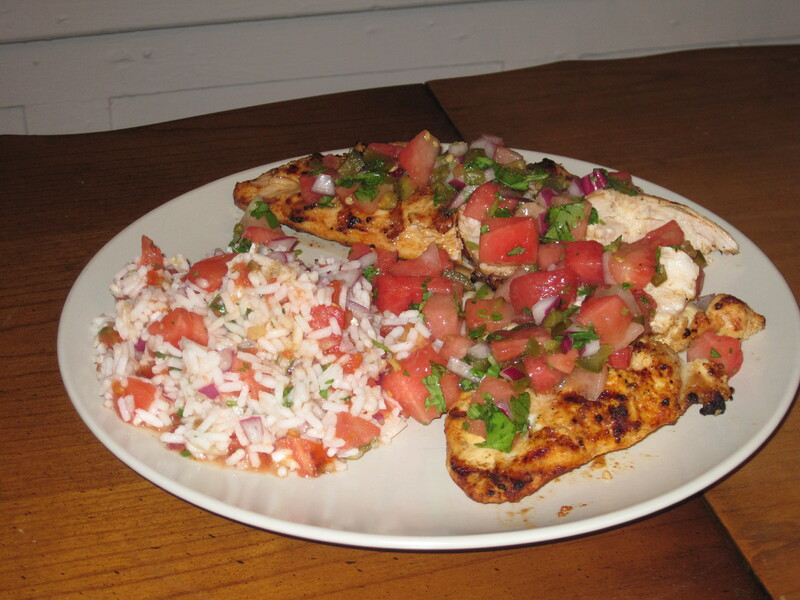 Serve rice on plate and serve the watermelon salsa on top of the grilled chicken. Enjoy! Listen, since this is my first Husband’s Corner, I want to start off by saying that I grilled the hell out of that chicken. It was perfectly juicy and evenly cooked, no crispy edges or questionably pink spots whatsoever. I think Jen should change the title of this dish to “Platonic Ideal of Grilled Chicken with Watermelon Salsa and Rice”, it was that good. How good was it? Well, for one thing, our puppy Margot crapped all over the floor when I brought the chicken inside, due to what I assume is disbelief and awe. That’s how impressive it was – a dog wanted to eat my chicken so bad that her brain rerouted all her energy so she could concentrate on wanting to eat my chicken, at the expense of control of the rest of her bodily functions. And if there is one thing Margot knows how to do, it is wanting to eat chicken. Now, you may be saying to yourself “Didn’t you just accidentally condition her to expect a treat whenever you go out to the balcony where the grill is because you would go out there to hide and stuff her amoxicillin in a Pupperoni when she had that urinary tract infection so she wouldn’t freak out when you opened the bag? She probably crapped as punishment for you not giving her a treat”, but you would be wrong. The dog wanted the chicken. The watermelon salsa itself was great, very refreshing, and not overly oniony, which was a concern of mine during the preparation. It was spicy, but not so much that it was a distraction from the taste or great texture, and the cool watermelon kept any spice under control. The cilantro and cumin, two of my favorite tastes, really popped. If you can’t enjoy perfectly grilled chicken with watermelon salsa, I’m going to need to see your original birth certificate, because I can’t believe that you’re really an American. Actually, considering that I know that watermelons are pretty important in Mexico, and that this salsa was Latin-inspired, I’m going to need to see either a birth certificate or a certificado de nacimiento, because I can’t believe that you are either an American citizen or a native of a number of Central and South American countries. The Western Hemisphere: Love it or leave it. Overall, a great summer dish, that I think would probably translate well to cooler weather, especially if you had it with tortilla soup or something like that.